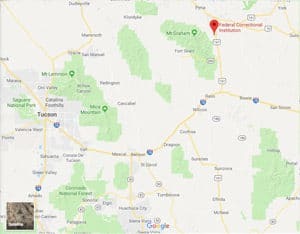 Location: FCI Safford is located in southeastern Arizona, 127 miles northeast of Tucson, 165 miles east of Phoenix, off Highway 191, 7 miles south of the town of Safford. Background: FCI Safford was originally opened in 1974 as a Federal Prison Camp. In 1985, it was converted to the low security federal prison it is today. Notable inmates include Earth Liberation Front (ELF) member Kevin Tubbs (released in 2016 after serving 12 years for arson) and Allen Pace (serving a 24-year sentence for armed robbery). Housing: Inmates are housed in dormitories, which are divided into eight-person cubicles. Health Services: FCI Safford health services include sick call, medications, medical emergencies, dental sick call, routine dental care, eyeglasses, hearing aids, physical examinations, and HIV testing. Inmates are assigned to a particular mid-level practitioner (MLP) who treats them for the duration of their stay. Emergency medical care is available 24 hours a day. Psychology Services: All inmates are screened by a psychologist during the institution’s admission and orientation program. If there is a demonstrated need, services are offered in the areas of substance abuse treatment as well as other behavioral and emotional problems. Crisis counseling is available by contacting any staff member and asking for Psychology Services to be contacted. Residential Drug Abuse Program (RDAP): FCI Safford houses a Residential Drug Abuse Program (RDAP). It also offers a Drug Education class and the Non-Residential Drug Abuse Program (NR-DAP). Education Services: FCI Safford provides literacy, GED, and English-as-a-Second Language (ESL) programs to inmates. Adult Continuing Education (ACE) and parenting classes are also available. High school diplomas and post-secondary programs are available through paid correspondence programs. Advanced Occupational Education: FCI Safford offers advanced occupational education in Carpentry, Business, Retail Sales, and HVAC. Vocational Training: FCI Safford offers vocational training in Business, Carpentry, and HVAC. Apprenticeship: FCI Safford offers apprenticeships in Cabinet Making, Culinary Arts, Dental Assistant, Electrical, HVAC, Plumbing, Commercial Driver’s License, and Small Gas Engine. Library Services: A leisure library includes a variety of magazines, newspapers, reference materials, and fiction and nonfiction books necessary for meeting inmates’ educational, cultural, and leisure needs. Inmates are also able to prepare legal documents and access legal materials via the TRULINCS Electronic Law Library (LexisNexis). The law library contains required legal publications, general legal reference materials, and a selection of Bureau of Prisons policies. UNICOR: The FCI Safford UNICOR facility produces clothing and textiles. Commissary: Inmates may use funds in their account to purchase items at the institution commissary, place funds on their inmate phone account, purchase TRU-Units for their TRULINCS account, or send funds in another manner. Inmates must have their commissary card in their possession at all times for identification purposes. All purchases are limited to $180.00 every two weeks with the exception of over-the-counter medications, Nicotine Replacement Therapy patches, and postage stamps. An additional $50.00 is added to the spending limit during the November/December period to allow for holiday item purchases. Recreation Services: The FCI Stafford Recreation Department consists of the equipment issue room, hobby shop, music room, weightlifting area, auditorium, and outdoor activities. The department also offers organized intramural leagues throughout the calendar year for soccer, volleyball, softball, and basketball. The hobbycraft programs include drawing, painting, leather craft kits, crochet, airbrush, and beading. Feature length movies are shown in the auditorium on weekends and holidays.